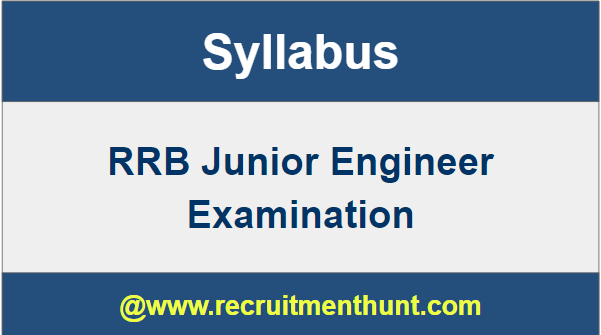 RRB Junior Engineer Syllabus 2019 is now available here. The candidates are asked to download the latest RRB JE Syllabus 2019 which we have provided below. Here we have given subject wise topics which will be asked in the RRB Junior Engineer Exams. So, candidates who have applied for RRB Recruitment 2019 for Junior Engineer posts, can check the recent JE RRB Syllabus here. We have also provided the Railway Recruitment Board Exam Pattern below for the aspirant’s purpose. Aspirants must check the Rail Engineering Jobs exam pattern and make a timetable for preparation without wasting time. As the complete details regarding RRB JE Syllabus, 2019 and exam pattern of RRB Junior Engineer exams are covered here, the applicants must download the RRB Junior Engineer Syllabus prepare well and crack the Railway Engineering job Vacancies 2019. Latest news regarding the RRB Junior Engineer Recruitment 2019 updated here. Online application available dates will update soon. Click on the below link to get more details of RRB Recruitment for Engineers. The latest syllabus of Railway Recruitment Board Junior Engineer posts is updated here. Get Railway Engineering Exam 2018 syllabus from below sections. Indian Railway jobs for Engineers 2019 is the golden opportunity for the Engineers who dreamt of working in the Central Government Sector and Indian Railway Jobs. Candidates can check the detailed RRB JE Exam syllabus, weight age for each topic of RRB Junior Engineer 2019 exam and some tips below. So, without wasting time the aspirants should start the preparation for 2019 Rail Engineering jobs by making a perfect plan. Get overall Railway Junior Engineer syllabus information for RRB JE posts and download RRB Junior Engineer PDF file of RRB Junior Engineer Exam Syllabus 2019 from below link. The Railway Recruitment Board recently issued employment notification 2019 for filling 5600 Junior Engineer posts. Numerous candidates have been applied for RRB JE 2019 vacancies. So for their use, we have presented detailed RRB JE exam syllabus and exam pattern of the RRB Junior Engineer jobs. Therefore, the aspirants should download the Complete RRB syllabus 2019 below and start the preparation for Junior Engineer vacancies in Indian Railways 2019. The exam pattern for Junior Engineer vacancies in RRB is as follows. Indian Railway posts Exam has objective type examination. The RRB JE paper contains total of 4 sections – GK, Reasoning, Aptitude, and Technical subjects. There will be 90 questions in the technical section and 60 questions in other sections.S o, the total questions are 150. Negative marking is applicable for each wrong answer in RRB JE Vacancies of 2019. Total RRB JE exam duration of 2019 is 2 hours. As there will be less time and more questions in RRB Junior Engineer examinations, the candidates must know how to manage the time well. Hence the aspirants should prepare accurate time plan before starting the RRB JE 2019 exam. The branch-wise and subject wise topics of RRB Junior Engineer Recruitment 2019 examination are as follows. So, download the RRB JE syllabus PDF and start preparation for the RRB exam in 2019. Circuits & Measurement Systems. etc. Carrier transport in silico: drift current, mobility, and resistivity. Decision making, Direction sense test, visual memory. Blood relations, figural classification and arithmetical reasoning. Similarities and differences, space visualisation /orientation, analogy. Coding & Decoding, Arithmetic number series. Finally, Candidates can download RRB Junior Engineer Syllabus here. So, Applicants can make their preparation easier by following RRB Junior Engineer Syllabus. Download RRB Junior Engineer Exam Patterns along with RRB Junior Engineer Previous Year Question Papers 2019 on this article. Also, For more Job Updates stay Tuned to our site Recruitment Hunt.